Christmas is coming soon and it’s a great time to teach kids about the birth of Christ. I alway like to have a 4 week teaching series during to add structure to the Holiday Season. As children’s ministry leaders, we need to keep Christ at the center of Christmas. Our friends at Children’s Ministry Deals have done a great job with the curriculum for the holidays. They alway add a creative touch and often tie it back to something popular happening in “kid culture.” Let’s face it – we need to keep finding new ways to tell the familiar stories. The truth is timeless, but the methods must be always changing to connect with the new kids sitting in our ministry classrooms. Click here to see all their Christmas Curriculum for Children’s Ministry. Every year, Children’s Ministry Deals releases new Christmas curriculum, programs, and lessons that thousands of churches use to add some excitement to their Children’s Ministry. 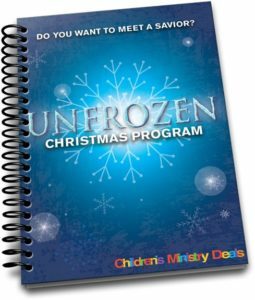 They’re all-time best-selling Christmas curriculum series’ is unFrozen 4-Week Children’s Ministry Curriculum, inspired by Disney’s Frozen. Even with this movie getting a little older, it’s still has a major appeal to kids in your church (especially girls). 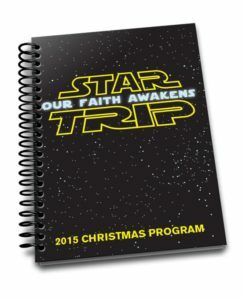 In 2015, the most popular Christmas curriculum was Star Trip 4-Week Children’s Ministry Curriculum, inspired by Star Wars. You can download the first lesson for free from each series’, but the best part is every curriculum has a corresponding Christmas program that you can download for free. Plus, Happy Birthday Jesus is a really fun and creative stand alone lesson that you can use on Christmas and download for free. Did you know Disney is releasing a new Star Wars episode every winter for the next 5 years! This is going to be capturing their imaginations for sure. Tony Kummer (Editor) reviewed & updated this page on : September 24, 2018 at 7:33 pm. All our content is peer reviewed by our readers, simply leave a comment on any post suggest an update.